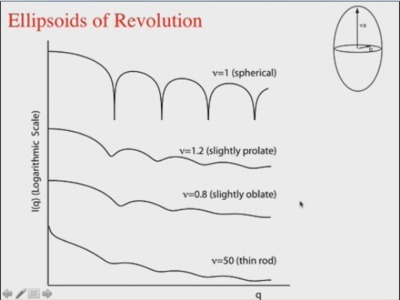 Videos 5.1-5.5 discuss techniques of small angle X-ray scattering (SAXS), commonly used to study dispersions such as proteins or colloids, or void distributions in a solid material. These videos are independently accessible without viewing those in previous sections. 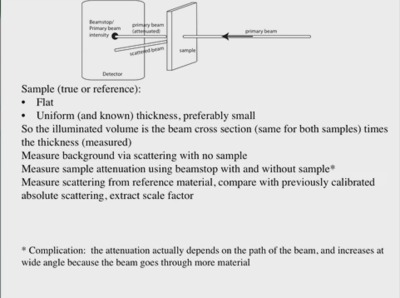 Introduction to small angle scattering (SAXS). Calculation of expected pattern from a suspension of spherical particles. 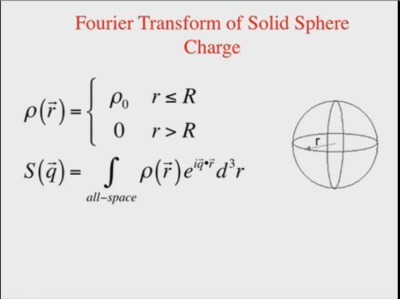 Spherical coordinates. The Rayleigh function. Effects of interparticle correlation and size dispersity. Time 10:02. 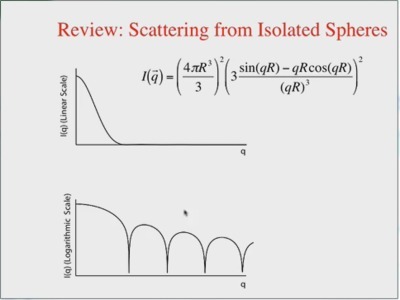 Extends discussion in Video 5.1 by discussing small angle scattering from suspension of nonspherical particles, including ellipsoids, cylinders, and coated spheres (core-shell model). Time 7:06. 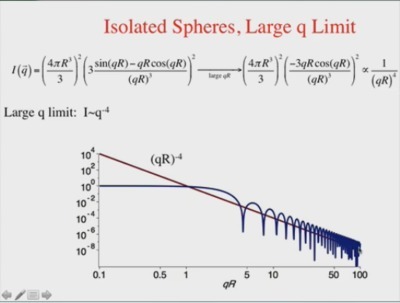 Discuss the power law intensity behavior for small angle scattering from objects of different geometries, including spheres, rods, disks, Gaussian coils, and fractals. Potential pitfalls in analyzing power law intensity profiles. General results and complications. Time 8:23. Different ways of representing SAXS data. Porod plots pull out high-Q features on a linear scale. Guinier plots can be used to extract the radiation of gyration. Kratke plots can help distinguish between extended and compact conformations of chains such as proteins. Time 6:44. When the incident and scattered X-ray intensities, and the volume of sample accessed, are well understood the scattered intensity can be used to obtain quantitative information such as the internal surface area of a porous system. Time 11:23.